I write both roma nce and women’s fiction novels. They are very different even though they may contain many of the same elements. A romance has to focus on one key romantic relationship above all. A women’s fiction novel can be about multiple relationships and characters. My women’s fiction novel, Summer in the City (which is on super discount this week only for 99 cents at Amazon), is a good example of the differences between women’s fiction and romance. In a romance, there is only one right answer: the two lovers find their Happy Ever After. In Summer in the City, I show three very different approaches to love and marriage among three old friends who reunite for a summer in Manhattan. One of the women has led a very conventional, long-married life, and is hesitantly seeking a change. She has no clue what that change will be. She’s certainly not looking for love, even though she finds it. Her best friend has been having random affairs for decades to fill the hole in her heart since the blow-up of her big love affair. When her old lover re-enters her life, she’s unsure what he wants of her and what she needs from him. And the third friend, the one with the seemingly perfect life, has a constantly unfaithful husband whose latest outrage pushes her to take drastic action. Whether to save her marriage or to end it is anybody’s guess. The romantic lives of my three characters are very important to this story, but the fantasy of a summer of freedom and change in Manhattan is equally important. New York is the undeclared main actor in Summer in the City. Many of the characters’ dramatic moments happen at fabled locations in New York. The glamour and excitement of life in the Big Apple is front and center even as they grapple with personal issues as varied as alcoholism, mental illness, cougar romance, and hostile step-children—just to name a few. Then there’s the reality that not every problem can be solved. Romances typically dwell only on problems that have clean, neat solutions. Women’s fiction can and does include issues that don’t have easy answers, problems that won’t go away entirely even if a heroine grows and changes and finds true love. An example of that is battle one of my character has with the bottle and with hoarding tendencies. At the same time, in women’s fiction, characters are not burdened to do the impossible. Facing challenges, working on life problems, and coming to equilibrium with seemingly intractable issues are proud personal achievements that give these stories a hopeful glow. Women’s fiction stories are not the fairy tales that romances often are, and they can be richly satisfying because they deal with life’s problems head on, yet in a positive manner. 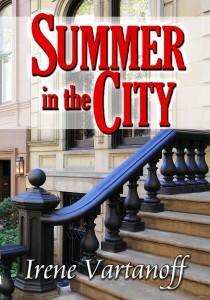 Summer in the City is a fun story. I hope you’ll take a look at it on Amazon and see for yourself.